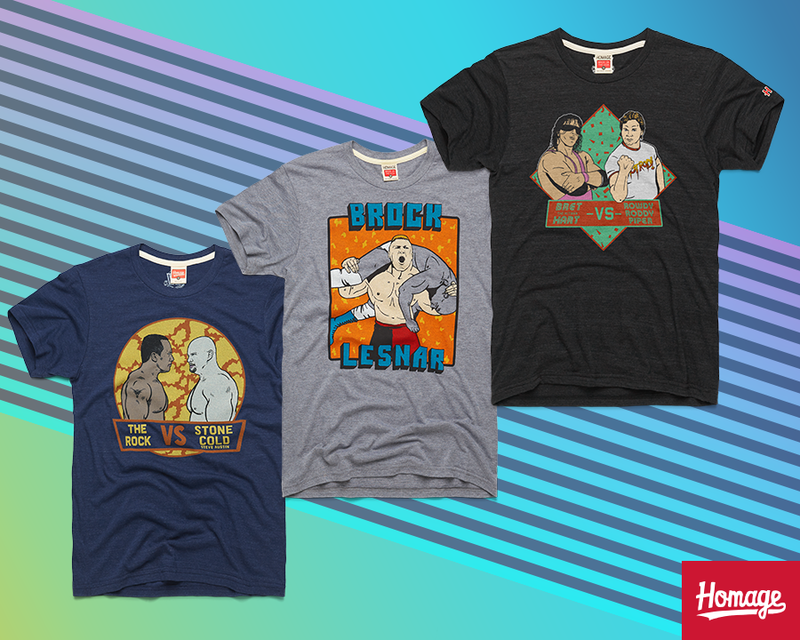 We’re on the Road to WrestleMania, and to celebrate The Showcase of the Immortals taking place next weekend in New Orleans HOMAGE has released three awesome new WWE t-shirts that pay homage to some of Wrestlemania’s greatest moments. First up is “The Rock vs Stone Cold”, which is based on these two WWE Superstars main event match at WrestleMania X-Seven in Houston, Texas. Their WrestleMania rematch was nothing short of epic – a back and forth battle that electrified the audience, but ended with a swerve no wrestling fan expected. Then there’s “Bret Hart vs Rowdy Roddy Piper”, based on the two WWE Hall of Fame members’ now legendary WrestleMania VIII Intercontinental Championship match. This friendly contest soon turned into a bitter war between the Hitman and Hod Rod. Styles Clashed, rules were broken, and a new champion was crowned in front of 60,000+ people. Last, but certainly not least, is this “Brock Lesnar” t-shirt! Now we call can travel to Suplex City with this design that pays tribute to Brock’s many iconic WrestleMania matches – from his instant classic with Kurt Angle to ending The Undertaker’s seemingly endless streak. 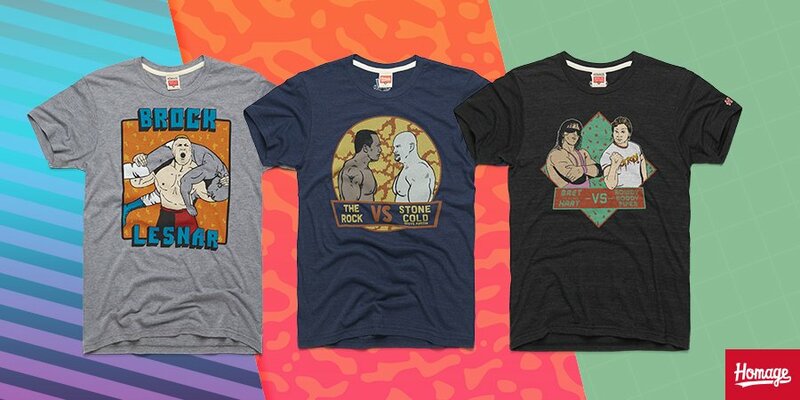 All three WWE WrestleMania t-shirts seen here are currently available at the HOMAGE online store, in sizes XS-3XL, for $32 each.